Nick is deeply concerned about the state of the local rail service and the impact on his constituents of the new GTR/Southern timetable. Under the new timetable a raft of peak direct commuter services to London Bridge and Clapham Junction from Hassocks have been removed, increasing journey times. Nick feels this is especially unacceptable when the village and surrounding area are facing a large increase in housing numbers. On 22 May he had a meeting with the Rail Minister, Jo Johnson, to discuss the impact of the changes, and has written to the Transport Secretary, Chris Grayling, asking him to take "all possible steps" to restore rail services to his constituents as soon as possible, and in particular to review the new timetable as it affects Hassocks to ensure that peak time services are returned. Matters have been made far worse by what Nick describes as the 'chaotic' and 'shambolic' introduction of the new timetable and Nick is keen to ensure that this situation does not continue over the summer. The timetable changes were supposed to improve services overall, but in Nick's view they have "manifestly been abysmally planned and executed, and those responsible must be held to account for the failures". Nick welcomed the statement made to the House of Commons by the Transport Secretary on 4 June, announcing that there will be a special compensation scheme for passengers on affected routes and he applauded the Government's announcement of an inquiry by the independent Office of Rail and Road into the timetable changes. He welcomed the Transport Secretary's assurance to the House that robust enforcement action will be taken against GTR if necessary, and Nick will fully support any such action, including the loss of the franchise: "No more excuses can be made for this company, which has completely lost the confidence of my constituents." In addition, Nick takes the view that infrastructure issues (which before industrial action began were causing 60 per cent of delays) also needed dealing with by Network Rail. The service became far worse in 2017 as a result of industrial action involving strikes and an effective 'work to rule'. This union action, over the introduction of driver-only operated trains, was wholly unjustified. Such trains already operate safely across the national rail network. Since their introduction on Southern the number of staff on trains has increased, not decreased, and no members of staff have lost their jobs or pay. The Government has made substantial investment in the rail service. The £6 billion London Bridge upgrade caused significant disruption while work took place, but will improve services. In January 2017 the Government announced a £300 million package of improvements to boost the resilience of the infrastructure on the Southern and Thameslink railway networks, to be delivered by Network Rail. The Government has also put in place measures to make the operator and track work together more effectively, and in November 2017 announced that the Thameslink, Southern and Great Northern franchise, which is currently held by GTR, will be broken up in 2021. However, Nick's view is that further reform is needed, and that rail lines in Sussex need major new investment to meet rising demand and improve old infrastructure. The number of passengers on Southern's lines has doubled in just a decade. Local people deserve an accountable rail service that is fit for purpose. Arundel & South Downs MP Nick Herbert has welcomed news from Govia Thameslink Railways (GTR) that they will restore a peak-time rail service between Hassocks and Clapham Junction. 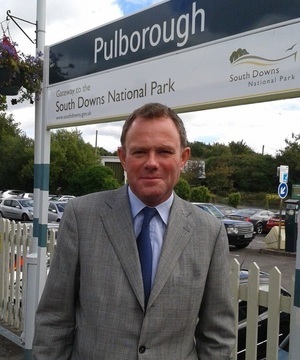 Arundel & South Downs MP Nick Herbert has welcomed news that GTR will undertake a public consultation to add direct peak-time train services from Hassocks to Clapham Junction. Arundel & South Downs MP Nick Herbert has welcomed Govia Thameslink Railway’s decision to reinstate the 08:28 train service from Wivelsfield to Hassocks as part of its new ‘interim’ timetable introduced this week, from Sunday (15 July). Arundel & South Downs MP Nick Herbert has welcomed the announcement of a compensation scheme for Thameslink passengers who have suffered weeks of disrupted services as a result of the new timetable introduced in May. It’s the seventh week of this railway shambles. Passengers must be compensated – and companies and managers fired. Nick’s article for Conservative Home where he calls for accountability for the “shambles” of the new Thameslink timetable, and for a “significant rebate” for passengers. In his article for the West Sussex County Times, Worthing Herald & Chichester Observer, Nick discusses the European Union (Withdrawal) Bill and his actions on the local rail service. Arundel & South Downs MP Nick Herbert separately met with Network Rail’s CEO, Mark Carne, GTR’s Passenger Services Director, Angie Doll, and the Transport Secretary, Chris Grayling, on Tuesday (12 June) to raise his concerns about Hassocks rail services. Arundel & South Downs MP Nick Herbert has written to the Secretary of State for Transport, Chris Grayling, about the chaotic introduction of the new rail timetable. Arundel & South Downs MP Nick Herbert met the Rail Minister, Jo Johnson MP, this week to raise his concerns about the new GTR/Southern timetable which has removed some peak time direct services between Hassocks and Clapham Junction. Nick met with GTR CEO Patrick Verwer and Network Rail South East route manager John Halsall to discuss ongoing issues with rail service in the constituency. GTR confirmed that, from the date of the timetable change on Monday 20 May 2019, a direct Southern service will be reinstated between Hassocks and Clapham Junction at 07:10 in the morning peak time, returning at 17:24 from London Victoria. Nick attended a meeting of the All Party Parliamentary Group for Rail in Westminster, to discuss the Government’s Rail Review . The Review, which is chaired by a former Chief Executive of British Airways, will look at proposals to integrate track and operating companies more closely. At a meeting with Patrick Verwer, CEO of GTR, Nick received assurances that GTR plans to undertake a public consultation in early 2019 to add direct peak-time train services from Hassocks to Clapham Junction. Nick met with senior managers from GTR and Network Rail to discuss the local rail service. Further to his letter of 2 July, co-signed by 14 Conservative MPs, to the Transport Secretary calling for a "significant rebate" for passengers who had suffered "appalling disruption" in the wake of the new timetable introduction, Nick received a response from the Secretary of State giving further information on the special compensation scheme for Thameslink passengers. The Transport Secretary also set out what measures are being taken to restore service reliability and to ensure that this is not repeated in the future. Nick spoke in the Commons Urgent Question on the Govia Thameslink Franchise, urging the Rail Minister to look again at the issue of direct peak services between Hassocks and Clapham Junction. Nick met with the new Chief Executive of GTR/Southern, Patrick Verwer, to discuss the local rail service, the present disruption and the roll-out of the interim timetable. At the meeting in the House of Commons, which was also attended by John Halsall, South East Route Managing Director at Network Rail, Nick restated his call for the restoration of peak direct Hassocks to Clapham Junction services. Further to Nick's letter to the Secretary of State of 4 June, Mr Grayling wrote back to Nick apologising to passengers that have experienced disruption, and outlining the steps being taken to improve reliability on the network. Nick welcomed GTR's decision to reinstate the 08:28 train service from Wivelsfield to Hassocks as part of its new ‘interim’ July timetable, an issue which he had raised directly with the rail operator. Nick received a letter from the Transport Secretary, Chris Grayling, regarding a new compensation scheme for Thameslink passengers. This followed Nick's call for compensation for passengers affected by the "appalling" disruption on the network. Nick spoke in the Commons Urgent Question on Govia Thameslink to raise the ongoing disruption and to call for a compensation package, to be funded by GTR. In response the Rail Minister, Jo Johnson, recognised that local passengers, including those who use Hassocks station, have endured an unacceptable level of service, and will receive compensation comparable to that given to Southern passengers in December 2016. Nick wrote to the Transport Secretary, Chris Grayling, calling for a "significant rebate" for Thameslink and other rail passengers who have suffered "appaling disruption" following the "chaotic" introduction of the new rail timetable. The letter was co-signed by 14 other Conservative MPs whose constituencies are served by Thameslink. Nick also wrote an article for Conservative Home calling for accountability for the "shambles" of the timetable introduction, and restated his call for significant compensation for passengers. You can read his news release on this here. Nick wrote to the Rail Minister, Jo Johnson MP, to follow on from his recent Westminster Hall debate. He again highlighted the impact on his constituents of the continuing disruption and asked if the Minister would raise the issue of direct Hassocks-Clapham Junction services with GTR. Nick received an update from Nick Brown, COO of GTR, on the implementation of the new timetable and on GTR's upcoming change in management, with current CEO Charles Horton stepping down to be replaced by Patrick Verwer. In the letter Mr Brown acknowledged that "The service has simply not been good enough for you and your constituents, and for that we are truly sorry". He went on to explain the plans to rectify the disruption arising from the new timetable changes - You can read GTR's letter in full here. Nick had a meeting in Parliament with John Halsall, South East Route Managing Director at Network Rail, and Nick Brown, GTR's Chief Operating Officer, to raise his constituents' concerns over the local rail service. He raised a range of issues, including the ongoing disruption and specific issues arising from the new timetable changes. Nick asked GTR to review the recent timetable changes, particularly those affecting Hassocks station, and he wrote directly to Nick Brown to raise constituents' specific concerns. Nick spoke in a debate in Westminster Hall, which he secured, about rail services to and from Hassocks. He raised the ongoing issues with disruption on the rail network, and the withdrawal of direct Clapham Junction services under the new timetable. Nick was interviewed by BBC Radio Sussex following the debate, and you can read his accompanying news release to the local media here. Nick met separately with Network Rail’s CEO, Mark Carne, GTR’s Passenger Services Director, Angie Doll, and the Transport Secretary Chris Grayling to raise concerns about local rail services, in particular the services to and from Hassocks and the impact of the new timetable changes. Nick asked the Leader of the House of Commons, Andrea Leadsom, to schedule an urgent debate on the "abysmal" performance of GTR and Network Rail. Nick wrote to the Chief Operating Officer of GTR/Southern, Nick Brown, following a meeting in the House of Commons, to raise local concerns over the impact of timetable changes. Nick wrote to the Secretary of State for Transport, Chris Grayling, to voice his strong concerns over the "appalling state" of the local rail service and the disruption faced by passengers on the GTR/Southern Network arising from the new timetable changes. Nick wrote to Charles Horton, Chief Executive Officer of GTR/Southern and Jo Johnson MP, the Rail Minister, to ask them to reinstate peak time direct services from Hassocks to Clapham Junction. Nick also appeared on BBC South East Today to speak about the timetable changes. This week Nick met the Rail Minister in Parliament to raise his constituents' concerns over the removal of the peak Clapham Junction services. Nick attended a meeting of the APPG on Southern Rail with Nick Brown, the Chief Operating Officer of GTR/Southern and John Halsall, Route Managing Director South East at Network Rail, to hear about planned works on the network and the introduction of the new timetable. Nick raised the need for further major investment in the local rail network as well as the issue of peak trains not stopping at Hassocks under new timetable. Nick met with the Transport Secretary and the Rails Minister to discuss the local rail service and impress on the Government the need to ensure that performance continues to improve across the network. They also discussed the upcoming industrial action by the RMT. Nick emphasised the need for GTR/Southern to improve their management of the network, including the operation of ticket machines and offices, again raising the case of Hassocks station. Nick wrote again to Nick Brown, COO of GTR, to reiterate his expectation that GTR urgently address his constituent's concerns regarding persistent faults with the ticket machines at Hassocks station and a failure to properly staff the ticket office. Nick received a response from GTR/Southern which you can find here. Nick also received a response on this issue from the Rails Minister which you can find here. Nick attended the inaugural meeting of this Parliament of the APPG on Southern Rail, and was re-elected as an Officer of the APPG. Nick and other Southern MP's were joined by Nick Brown, COO of GTR, and John Halsall, South East Route Managing Director at Network Rail. Nick challenged GTR on the need to improve performance on the line and again raised the issue of Hassocks' ticket office and out-of-order ticket machines. Mr Brown assured him that he was personally dealing with the matter and that GTR had ordered a new model of machine for the network. Nick wrote to wrote to Charles Horton, the CEO of GTR/Southern, to raise concerns over the proposed timetable changes to services to and from Amberley station, following significant local concern over the potential impact on local commuters and businesses. Nick received a response back from Nick Brown, the COO of GTR, stating that following a review Southern would add additional services to provide a half-hourly service during peak and shoulder-peak times. You can find this response here. Nick wrote to Charles Horton, the CEO of GTR/Southern, to raise concerns over the continued closure of the Hassocks ticket office and the persistent failings of the ticket vending machines. Nick received a response back from Nick Brown, the COO of GTR, outlining how Southern intend to improve the situation, which you can read here. Nick met with representatives of GTR/Southern to discuss the local rail service. Nick met with John Halsall, the South East Route Managing Director for Network Rail to discuss planned improvements to the Brighton Mainline. Letter from GTR announcing the restoration of the 08.28 Wivelsfield-Hassocks service. Letter from the Secretary of State for Transport regarding the Government's new 'Strategic Vision for Rail' (29.11.17). The Government's policy paper can be found online here. Letter from the Transport Secretary on the agreement reached between ASLEF and GTR/Southern to end their dispute over Driver Controlled Operation. (9.11.17). Letter from the Transport Secretary in response to the October strike action by the RMT. (29.09.17). Letter from the Transport Secretary regarding the £13.4 million package of performance and passenger improvements announced on Southern, and the decision of the drivers' union, ASLEF, to strike over pay. (13.7.17). Letter from the Transport Secretary, Chris Grayling, on ASLEF's resumption of their overtime ban, and the relevant contingency measures that have been put in place (29.6.17). Letter from the Rail Minister with an update on the status of negotiations between ASLEF and GTR (03.04.17). Letter from the Parliamentary Under Secretary of State, Paul Maynard, regarding the 'Delay Repay' scheme for passenger refunds (27.02.17). Letter from the Transport Secretary (02.02.17). Report from the Office of Rail and Road on Driver Only Operation and GTR/Southern (05.01.17). Letter from the Transport Secretary to MPs with an update on his efforts to resolve the situation (05.01.17). Letter from Charles Horton, Chief Executive of GTR, about the Office for Rail & Road (ORR) safety report on driver only operation: (05.01.17). Letter from the Transport Secretary (12.12.16). Letter from the Transport Secretary (02.12.16). Letter from the Transport Secretary on ASLEF (30.11.16). Letter from the Rail Minister (22.11.16) . Letter from the Transport Secretary (03.10.16). Letter from the Rail Minister (14.09.16). Letter from the Transport Secretary (12.09.16). Statement from the independent Rail Safety and Standards Board saying that there is no evidence of increased risk from driver operated doors on trains (11.08.16). Letter from the new Rail Minister, Paul Maynard (06.08.16). Letter from the new Transport Secretary, Chris Grayling (20.07.16). Statement from the previous Rail Minister, Claire Perry (11.07.2016). Letter from the previous Rail Minister, Claire Perry (15.06.16). Letter from the Chief Executive of GTR (14.06.16). Letter from the previous Transport Secretary, Patrick McLoughlin (08.06.16).